We have people coming in the shop, every color, every language, every age, every size. When dealing with the public, you just never know who will walk in. Some are happy, some are shy…every kind of personality. They all have one thing in common, the love of magic. I had a grumpy fellow in here before who did magic and I couldn’t help but wonder how he performed. Did he put on a cheerful face to perform? Did he have a grumpy act, that could be funny? He was kind of funny in his own way, even with his grumpiness. He was warm, enthusiastic, good-looking and charming, which you don’t have to be to be a great magician, but it doesn’t hurt! I look forward to seeing how he develops. I’m sure we’ll be hearing good things about him in the future. When I think of Spiritualism a picture of people sitting around a table in a dimly lit room, eyes closed, a candle burning, and some sort of mystic psychic person summoning up the dead comes to mind. Sometimes a Ouija board is involved. There are many books, of course, on the subject and over the years lots of controversy. Many people believed in it, some of them highly intelligent, and some still do. Somehow this phenomenon is intertwined sometimes with Mentalism and of course Mentalism is a part of magic. The difference is, to me anyway, when someone calls themselves a Spiritualist or a psychic, they expect others to take them seriously, as someone who can actually read your mind, or speak to the dead. Of course we can all speak to the dead, the trick is to get them to speak back. The psychic claims to be able to do this. Once a rabbi phoned me as he wanted a magician for a Purim party, but he said the magician must not be Jewish. I asked why not. He said Jews do not have special powers, only G_d has special power. So I asked him to tell me about Moses, when he turned the rods into snakes, etc. So he thought about it and said, “Okay, they can be Jewish, but they must not say they have special power. They have to tell everyone they are just doing tricks.” I said, most people understand that. But he wanted it made clear that they were only illusions. In all fairness to the rabbi, there are magicians and mentalists who pretend to have special powers. We know, as we have seen them on television, and heard them claim to have special powers, and then use items we have sold them. The problem is that some people believe them. There’s that fuzzy line. Actually the inspiration for this post was a new effect we just received. Most magicians and especially mentalists know about Spirit Slates, whereby the performer displays two large (approximately 8.5- by 11.5-inch) slates, blank on both sides. The slates are placed together with a piece of chalk in between and when they’re later shown, a written message appears! Now there is a new kid on the block! “Tiny Spirit Slates” by Quique Marduk. Perfect for restaurant Magicians who don’t want to carry big stuff around. 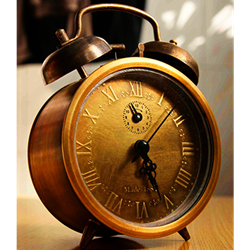 While on the subject, of Spiritualism and Mentalism, we have a Ghost Alarm Clock which would add a dramatic ring to your show, a little pricey but effective. if you are interested in finding out about spiritualism and props, books and DVDs on the subject click here. Cups and Balls in Magic. Is there a Renaissance? A few weeks ago I wrote about Don Alan and his Chop Cup. It was an act in itself. You can do that. You can make an act out of one prop but it better be good. I wrote about Cups and Balls before. While doing research I came across this interesting site http://www.magicana.com/cups#/history which I’m sure you would enjoy, as it is so cleverly put together. If you have not already seen it you are in for a treat. 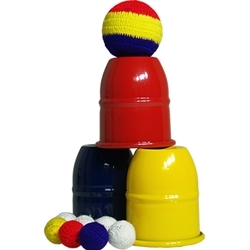 There are many Cups and Balls on the market and many DVD’s, books ,and Downloads for them. At Perfect Magic they range from $4.00 for a plastic set, to moderately priced ones to hundreds of dollars depending on whether they are aluminum, Brass or Copper. For a beginner, the $4.00 ones are fine. I highly recommend them, but when you go higher you have to be careful. The higher priced ones are ususally good but I decided to get some aluminum ones that were less expensive as not everyone can afford the high priced ones. The problem was that they did not sit securely on each other. They wobbled. I tried putting different ones together to find some that wouldn’t wobble but no luck. I ended up sending them all back. There is a plastic Chrome Finish set by Empire that is good and not expensive. Guy Camirand of the Camirand Academy of Magic used to have his students get those when he gave his courses here. He liked them very much. Technicolor Cups and Color Changing Balls. 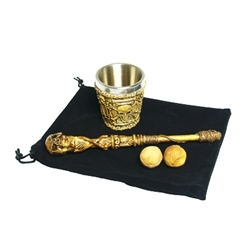 One of the lastest ones items in that category is the the Gothic Cop Cup and Wand and Balls. If you’re a collector it’s something you might want. Also Technicolor Cups & Color Changing Balls puts a whole new spin on it. Now there is a new one, and its really cute. I didn’t think I would go for it, but I had a good laugh at the end. It’s called Cup Cards. It’s easy to carry and has a good punch at the end! There are few secrets in this world. Magic was first exposed on a national or even international level with the Masked Magician many years ago, where every week he would expose another trick or illusion. Now, of course with the internet, magic is within everyone’s reach. Somehow it didn’t hurt magic. It peaked people’s interest and some thought, “If that’s all there is to it, I could do it to.” I remember people coming into the shop to buy things they saw the Masked Magician do. I have said many times, just because you can do the trick does not make it magic or you a magician. Which brings me to the thumb. If you are a magician you know what word is missing. Doesn’t matter. Is there a magician in the world that doesn’t have a thumb? Maybe a few. It’s something like owning a gun. A lot of people may have one, but how many really know how and when to use it properly? Most can vanish a silk and make it reappear. I’ve been in the business a long time and I do it myself, however when I saw Alexander De Cova do it, I could not believe it, because I know how it’s done, and yet he wasn’t doing that. When he revealed the method on his tape I thought it was brilliiant. You see everything, and nothing at the same time. The subject came to me this morning when someone ordered a DVD by Patrick Page on that very topic. He was putting in an on line order and had found it and then he couldn’t find it and could we help him. It was a DOWNLOAD and it was $12.50. It struck me that this is available to all magicians for such a low price, no shipping charges, no U.S. exchange rate to pay and I’m sure you get so much out of it. Wherever you live in the world, when ordering Downloads from us you pay in Canadian dollars the same amount as it is listed in the USA. IN other words, if the price is $19.00 US, and you pay $19.00 Canadian, it is acturally costing you $14.25 US as the Canadian dollar is worth about 75% of the American dollar right now and the Download prices are usually considerably lower than the hard copy anyhow. You can turn it into hard copy once its yours. If that’s not a great deal, I don’t know what is! I looked to see what else was available on the subject so here’s the list, check it out! just to name a few. 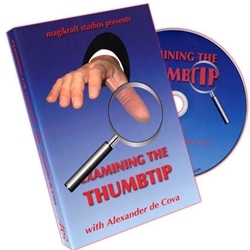 There are acessories and other individual tricks that involve the thumb, and if you use one, any of the above would give you much more mileage.